As the global rebound in oil prices has helped to close a hole in Saudi Arabia's budget, the kingdom on Monday ordered the resumption of annual bonus payments to all state employees starting in January 2019, according to Civil Service Minister Sulaiman Al-Hamdan, who told the state-run Al Arabiya TV during an interview on Monday. Riyadh removed the perk in September 2016 as oil was trading under $50 a barrel after bottoming below $30 earlier that year. The drop in oil prices blew a hole in the Saudi budget and forced the kingdom to explore an IPO for 5% of Saudi Aramco - a deal that has stalled in recent months as investment bankers haggled with the kingdom over Aramco's valuation. Saudi restored the payment to some civil servants in April 2017. 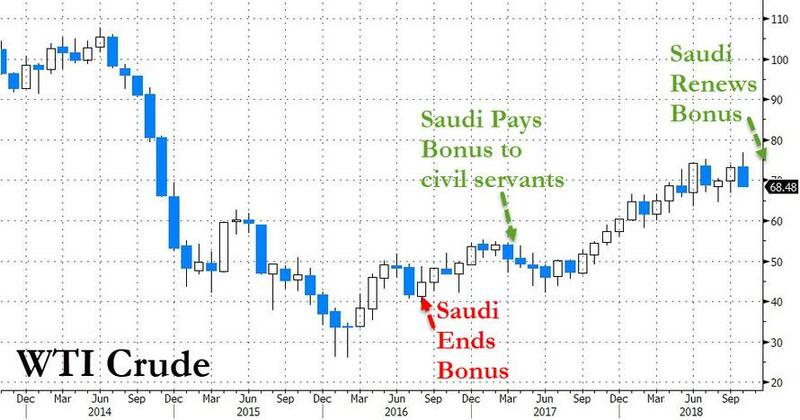 While some might be tempted to see this decision as a distraction from the burgeoning scandal over the murder of journalist Jamal Khashoggi, several analysts chimed in to point out that Saudi Arabia probably would have reinstated the bonuses anyway. 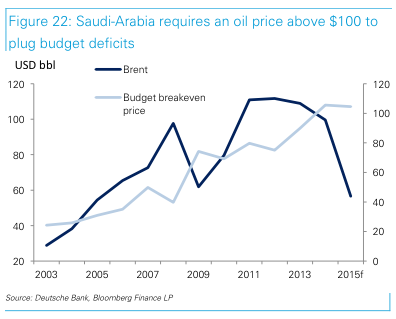 During the worst months of the oil rout, Saudi Arabia projected a budget hole equal to some 20% of GDP as two proxy wars combined with the necessity of maintaining the status quo for ordinary Saudis heavily taxed the country's reserves. And while the climb in oil prices has definitely relieved much of the pressure on the kingdom's finances, the oil price is still shy of where it would need to be to completely plug the Saudis' budget hole. So how high, you might ask, do oil prices need to climb in order for Saudi to plug the gap? Here’s Deutsche Bank with the answer. The bigger question is - why now? Is the Saudi monarchy concerned once against social upheaval following the Khashoggi chaos?